Homemade aprons. Interesting update is making homemade aprons out of old dresses and men's shirts. Apron figure 176 (left) is made from men's shirts. From backless shirts and shelves cut out the lower part of the apron, top and pockets out of the sleeves. For the manufacture of piping can always be found in my closet an old product with stripes, plaid or just plain bright color. All the details of the apron are rectangular in shape. The length can be different. To start sewing better with the production pockets. For this purpose, the parts of rectangular shape embroidered applique simple flower motifs and edging detail on top. The finished part primetyvajut to the average wedge the bottom of the apron with a hem at the bottom. ACC scribbled and prostrachivajut detail in the middle. The side sections thus obtained pockets sewn into the side seam pritochki parts of the apron. Ready the lower part of the apron around the upper prisebirch.The prepared zone is a strip of fabric of a width equal to twice the width of the edging and finishing with ACC and length, the size of the waist line with the seam allowance on the tie, primetyvajut and scribbled on the bottom of the apron so that the apron got in the fold belt and closed his upper cut. The upper section details the lapels are decorated with piping, side - seam bodybu. On the bottom slice zametyvayut two soft Darts, then cut and overcast prostrachivajut to the belt on the reverse side. Straps connect at back of waist with tie belt. 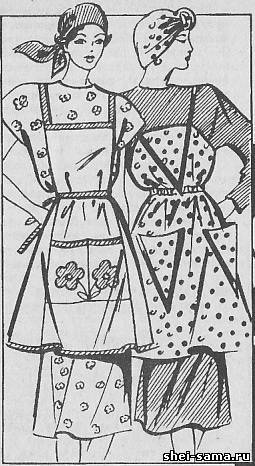 Apron (Fig, 176, right), you can make an old dress neotrazim waist, but if necessary it can be composed of several parts. The seam could be stitched straps and in the middle of the bottom of the apron. Additional stitches can pass on the side. On made so a whole piece of apron nastraivatsa shape pockets of the bag, banded on the side of cut. Detail file itagiba the seam or facing and the intended line scribbled waist from the inside, striped fabric yoke, which is inserted into a rubber band. The ends of an elastic band fixed, not reaching 3 cm to the edge.On the left end of the scenes of the overcast loop, on the right - sew a button. Prepared straps United in the middle of the corner, nastraivatsa on the bodice of the apron. Their ends attached to the upper oblique cuts on the back of the apron. Detail of an apron from a men's shirt with stripe pattern (Fig. 177, left) cut the same as in the apron at figure 176 (left), only the upper portion and pockets are composed of small parts, cut on the bias thread. Edging the pockets and the upper edge of the chest piece consists of two parts, connected by a corner. The lower rectangular part of the handle facing the apron and scribbled her pockets with ACC. The breast, the lateral border which goes into a halter neck, connect with belt and lower part of the apron in the same way as in the apron with the flower.The clasp is on the back in the belt. Fancy apron (Fig. 177, right) can be executed from more thin fabric shirts or dresses. Manufactured almost the same way as the apron in figure 176 (right). Instead of edging you can use cheap lace or crochet tie. A wide flounce is cut in a straight line filament, a gathered and sewn to the lower cut of the apron. Draw the neck with two narrow belt-straps attached to the toe top part of the apron. Removable finishing collars. The same dress is a simple shape of woolen fabric can be continually updated finishing collars. Graceful collar of guipure or tulle will make it feminine, tight with clean lines of the lapels is a firm, round, smooth, framing the neck, would be out of place in any environment. All forms of collars (Fig. 178-183) is offered to the dress with y-neck. Some of them added accents, reminiscent of a bib. The first image shows a classic collar, of cotton or silk fabric with a clear line of the lapels. The collar is cut double. If the fabric is soft and thin - strip required. For the clarity of its edge you can make decorative stitching silk thread (0.5 cm from the edge). The inner cut of the collar is treated with bias binding. Its width in a cut 4-4. 5 cm Pre-striped fabric is needed to pull the iron along the length. Bake put a face to podvorotnya and prostrachivajut. Tilting her bent loose cut, primetyvajut and prostrachivajut from the collar.The collar and bake iron. Figure 179 presents a small turn-down collar strict form on clinofibrate rack. It is attached to the dress on the front with insert on the back from the shoulder seams with piping. Collar, have a double on the strip. The insert is treated with podborta and issue closure. The visible edge of the parts can be mounted finishing line. The collar will be decorated with a tie or a butterfly, made of velvet, satin or other silk fabric. Asymmetric collar in figure 180 can be made from silk or cotton. It is also complemented by an insert and obrabatyvatsya as the previous one. Addition to the dress may be a collar clamp (Fig. 181). To better draped collar, it is made of silk or fine wool crepe fabric weave. The main detail of the collar - strip of fabric, cut on the bias yarns and stitched on the back seam. This collar attaches to the dress too with the insert and collar insert - using borders.The neck Shawki (front side) is applied and primetyvajut collar facing up, and then they face inward - bake. All grind off. Bake folded and rolled for a shorter look free cut, scribbled on the wrong side of inserts. The collar seam make bodybu. Simple and at the same time interesting design can be collar insert, cut to shape of the neck (Fig. 182). It consists of two zaparivalis on the front of detail at the top, connected by a seam at the back. Box cut out on the double strip, the upper edge decorate decorative stitching, internal cut the overcast on the machine or by hand. Zapihivaetsya the ends of the insert, you can attach a button or brooch. Romantic collar of tulle or lace (Fig. 183) consists of two flounces, cut in a spiral with a gradual decreasing of the radius to the middle of the front. The edges of the flounces, draped skirts, Runicom handle, internal cut piping. If the neckline is low, the collar can be supplemented with an insert.